After years of hiring people in corporate America, the most important lesson I have learned is you are really looking for a reason to NOT hire a job candidate. These reasons you would not hire someone for a job at Yahoo Answers holds true for contractors as well. After vetting the two contractors for the basics via the interview questions and comparing the two bids, both checked out as relatively good choices. I was torn. I decided, at this point, I liked Contractor #1 the best, just on gut instinct, and would begin checking his references first. I asked to see a home in progress. He had me stop by a large property in North Orange County, a 6,000 square foot house where his company had redone four bathrooms and built an ultra glamorous walk-in, 2-story closet. I was wowed and easily could look beyond the shabby chic décor to the meticulous workmanship. We also had dinner with some friends who had remodeled their kitchen with Contractor #1. Their home is a 1920’s craftsman mission style home in Orange. 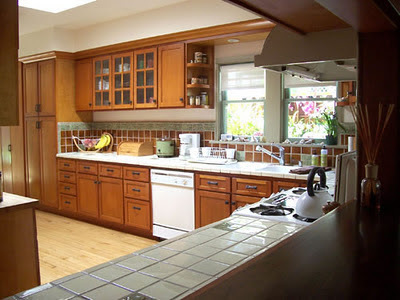 The new efficient, yet modern, kitchen was a perfect match with their nearly 100 year-old-home. My friends were thoroughly pleased and strongly recommended Contractor #1. Their opinion held sway with me. I liked Contractor #1’s communication style, and the fact he was in a family partnership. I was satisfied and called Contractor #1 and let him know he was the guy, except we couldn't afford the job. We needed the price to come down by 25% and would be willing to compromise on the details of the project, or perhaps eliminate items. He declared no problem and would get back to us by the end of the week. I continued to phone references that all spoke highly of Contractor #1 and many times referred his company to their friends and family. Contractor #1 also brought several subs into the house to help him rebid, throughout the week. By the end of week one, Contractor #1 sent a rather longish email, explain that he had spent ten hours on the new quote and he was not done and it was pretty hard to redo it. Wait until my picky architect gets a hold of him. I decided I needed options and began reference checking Contractor #2. I went to a place in Irvine where he had added a second story to a pretty awesome California style "grand" home. The homeowner was on the premises and toured me through the property. The homeowner was in the asbestos removal business and recommended this contractor strongly, saying that no matter how demanding the homeowner was, Contractor #2 just did it. No eye rolling, no arguing, no nothing. I called Contractor #2 and asked for a new quote and said I would pull things out. He said that he had been concerned about the architect's involvement with the project during construction and with the detailed nature of the plans. Without sounding too desperate, I asked him to please try. He said he would, and sent a revised quote back in three days. At the end of the second week, Contractor #1 finally sent back his quote. Both quotes again nearly matched. You would think these guys were phoning each other. It was an obvious choice for me. I emailed Contractor #2 and let him know he had the job. I contacted Contractor #1 and said I was sorry, he didn't have the job. He emailed back and asked for feedback -- he felt sure it was the money. He was wrong. Our accidental re-quoting exercise had introduced stress into the picture, and simply provided me a reason NOT to hire him. Right or wrong, that was all I needed.